Sarah is a solicitor at CFG Law and brings a wealth of knowledge and experience to the team. Her exceptional abilities to calm clients’ worries and actively listen to their needs shows she is a credit to both the firm and her clients. Sarah combines excellent legal expertise with a caring and compassionate nature, to provide support and care to injured people and their families. She is the perfect balance of professionalism and empathy, which goes a long way in making a real difference to the lives of people in need. 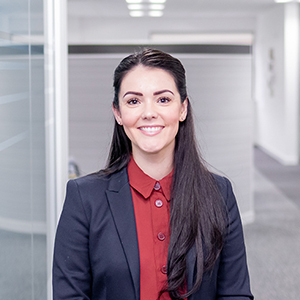 She tackles every case with a determination and efficiency that is unrivalled, always striving to get the very best result for all of her clients. Negotiating with even the most stubborn of Defendants. Addressing her clients' immediate and continued needs and supporting families through the process. Explaining the entire litigation process to clients and helping with their understanding. CFG Law’s approach to early rehabilitation and intervention and the importance of the client experience. Working in an environment that encourages obtaining the very best outcomes for clients. The friendly atmosphere and supportive team. Psychiatric injuries and the support, treatment and rehabilitation options available. The complications that can occur following serious traumatic brain injuries and complex orthopaedic injuries and the life changing effect these can have. Going on adventure days with my husband and daughter and finding new places to explore.